It’s an issue that still rages from time to time. What is “acceptable” content for entertainment geared toward a young adult or teenaged audience? Even in the 21st century, it’s debated how graphic the violence, sexuality, and language should be. Where is the cut-off? Is anything and everything okay? Or should there be stricter guidelines for YA fiction, for instance, than for fiction targeted for a more general audience? Whatever side of the fence you stand on, this is an argument that can get heated. And it’s not new. Within the comic book industry, it goes all the way back to the early 1950s. In The Eye-Dancers, Mitchell Brant is a comic book collector. Even Joe Marma has a few older Spider-Man issues. Neither of them, though, has what we now call “pre-Code” issues. 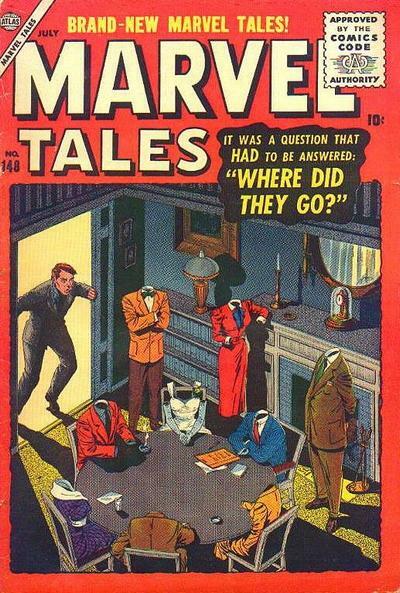 Pre-Code issues refer to comic books published prior to March/April 1955. The Code stamp, back then, was a large eyesore on the upper right of every comic cover. In subsequent decades, the Code stamp slowly decreased in size, as it became less and less of a concern. But in the mid-1950s, it was all the rage. In the mid-1950s, in fact, comic books, as an industry, nearly went out of business. It’s funny to think of old comics as anything but corny. Certainly post-Code, from the mid-50s on, they were. But in the early 1950s, there was no industry standard dictating what could and could not be used in a story or on a cover. And the writers and publishers in the comics industry pushed the envelope as hard as they could. So what did the comics publish in their place? Crime stories. 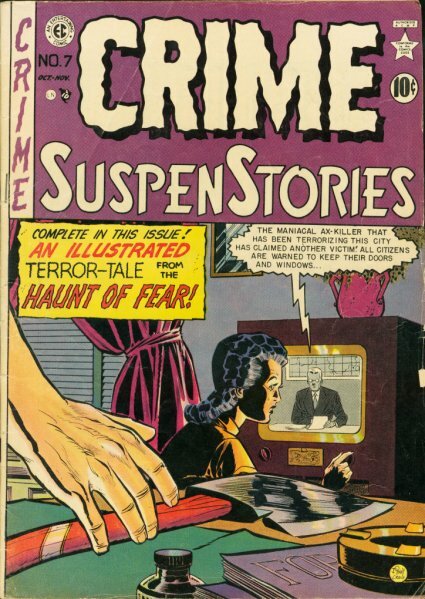 Suspense stories. And horror stories. Lots and lots of horror stories. And they weren’t corny. They weren’t cute. They were graphic. They were much more graphic than any movie out at the time. 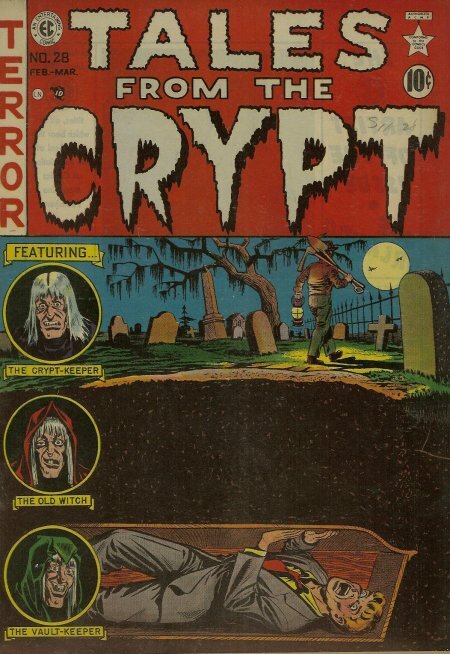 In fact, the HBO series Tales from the Crypt was based on the horror stories that EC Comics published in the early ’50s. 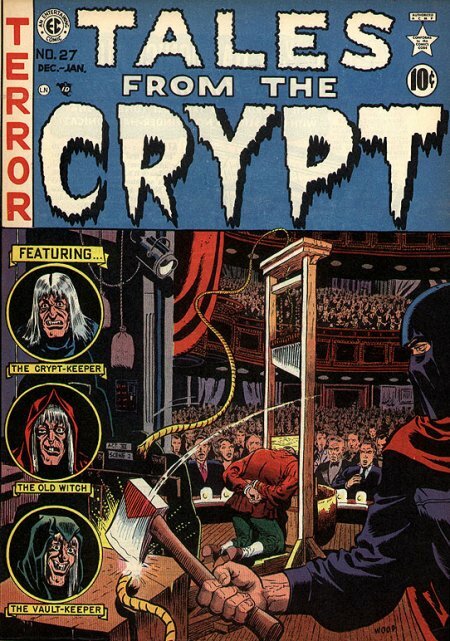 From 1950–1954, 1,650 issues of horror comic books made it to the newsstands. That translates to approximately 25 every month. And with each passing month, the issues became edgier, the covers more graphic, more daring. Here is a sample of what you’d have found at your local drugstore back in the early ’50s . 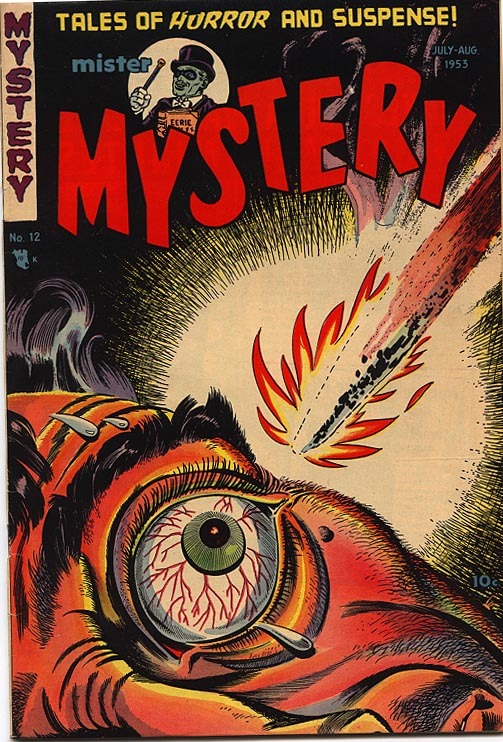 . .
For the most part, until 1954, any controversy about these comics was scattered, not well organized, and in no way a threat to the industry. 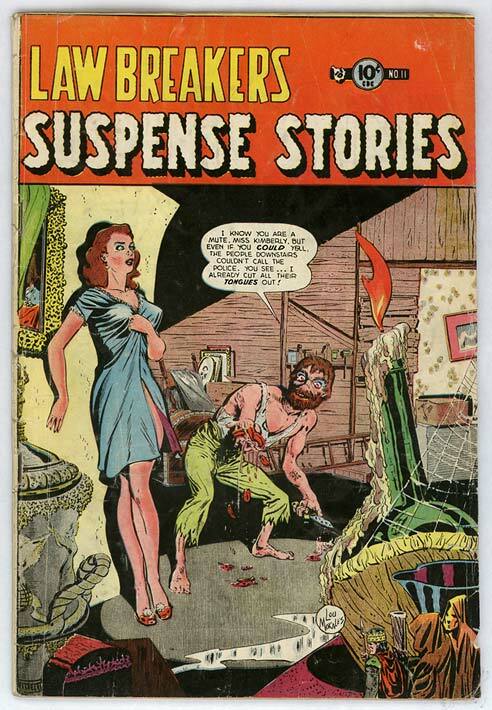 But then a book called Seduction of the Innocent, by Dr. Fredric Wertham, was published in 1954, and the death knell on horror in comic books had arrived. Wertham was a respected child psychologist. His words held merit to parents. And parents, for the first time in many cases, were now alerted to what their kids were reading. And it sure wasn’t Superman. Parents all across America united. Entire cities boycotted comic books. A firestorm anti-comics movement raged. Even the United States government got involved. The Senate Judiciary on Juvenile Delinquency basically handed the comic book industry an ultimatum: Clean it up, or pack it in. The comic book controversy reached the pages of Time magazine, Newsweek, and the front page of the New York Times. The end result was the industry self-censoring itself, stripping away much of the “pre-Code” feel of comic books. 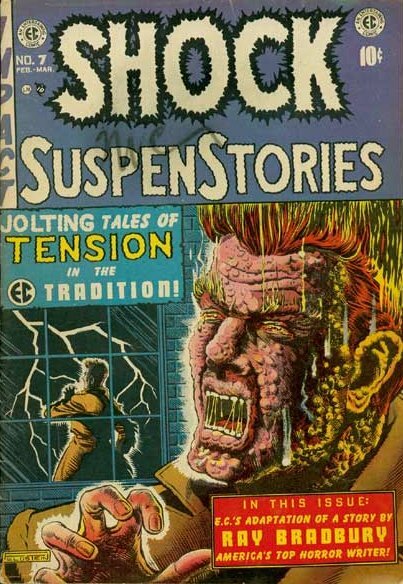 Nearly every horror comic magazine went out of business virtually overnight. They could not continue to publish the kinds of stories they wanted under the new, strict guidelines of the Code. The industry was on the brink of collapse. It needed something entirely new–and it would get it. But that’s a story for another day. Back in the mid-1950s, when the comic book debate raged, the term “young adult” was hardly used. “Juvenile” was the preferred term then. And Wertham, in his book Seduction of the Innocent, made sweeping assertions that the comics industry was contributing heavily to juvenile delinquency. Many parents agreed with him. Terms change. Society moves on and evolves. But certain points of debate still persist. They likely always will. 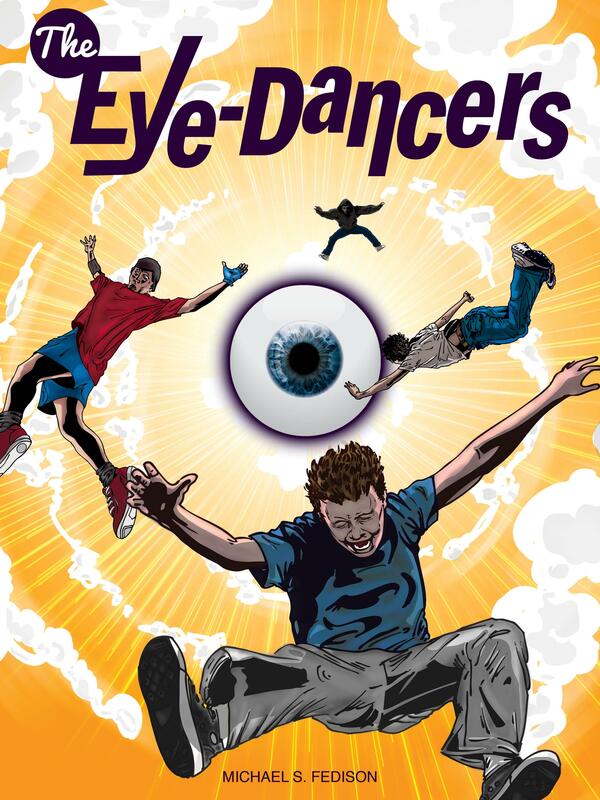 The Eye-Dancers is not a young adult book that would be considered to contain any “objectionable” material. Hopefully it contains a lot of thought-provoking and imaginative material, though! But for all the YA books that do indeed delve into or close to the “objectionable”–you’re not alone. Decades ago, the comic book industry was right there alongside you. The Eye-Dancers could not exist as an e-book without the services of Matt Gaston, of wavedesign.net. Matt is a longtime friend of mine–we’ve known each other since we were little kids. So it’s fitting that he is the artist and layout designer for The Eye-Dancers e-book. After all, one of the themes of the story is the special bond we form when we’re young, and the sense of discovery as we explore the unknown and face new challenges. Matt has come up with a first-rate cover for the book. But don’t take my word for it. Have a look for yourself . . . Thanks for your help, Matt.